Method of Application: Easily spread with a roller, spreader or brush. *NOTE: This product cures by reaction with moisture (humidity in the air and the materials you will glue). Changes in humidity, temperature and moisture content of the glued surfaces will affect open time and minimum clamp time. Maximum open time can be determined by excessive foam development in the adhesive. Minimum clamp time can be determined when squeeze out of adhesive becomes firm. 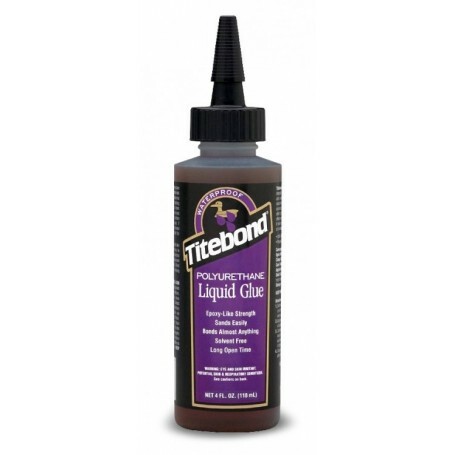 Titebond Polyurethane Glue is not for structural applications or for use below the waterline. For ease of application, the glue, temperature and materials to be bonded should be above 10°C. Lower temperatures will cause the glue to thicken.